Infoverity, a leading global professional services organization headquartered in Dublin, Ohio, together with its partner Informatica, will host clients from the healthcare, retail, financial, and manufacturing industries at The 2018 Memorial Golf Tournament on June 1, 2018 at the Muirfield Village Golf Club. The full day event will include access to the tournament grounds and all-day admittance into the Nicklaus Club at the 16th hole. 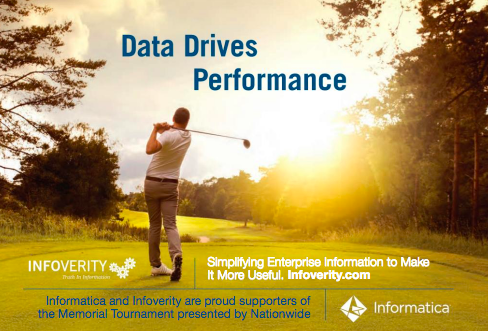 A Fantasy Golf game for attendees will actively showcase Infoverity’s Data Governance and Analytics solutions that leverage Informatica Cloud Real-Time to integrate Tournament statistics to a game data leaderboard and predictive model. The tournament, presented by Nationwide, is one of the elite events in professional golf, founded and hosted annually by Columbus native Jack Nicklaus and the Nicklaus family and played at storied Muirfield Village Golf Club. The Tournament and Nationwide Children’s Hospital have a long partnership, dating back to the inception of the tournament in 1976. The Memorial Tournament regularly attracts an outstanding global field, recognizes those who have distinguished themselves and contributed significantly to the sport, and at the same time ensures that many deserving charities are recognized and supported to help those in need. Nationwide began its presenting sponsorship of the Memorial Tournament in 2011 which bolstered the Tournament’s impact to charity, namely Nationwide Children’s Hospital through an alliance with the Nicklaus Children’s Health Care Foundation established in 2010. Founded in 2011, Infoverity is a leading global professional services organization focused on solving business problems caused by the proliferation and diversification of data in large enterprises. Infoverity provides Master Data Management (MDM), Product Information Management (PIM) strategy and implementation, Data Governance and Analytics, Managed Services and Hosting Solutions that help clients in the retail, consumer goods, manufacturing, financial and healthcare sectors to simplify and maximize the value of their information. Infoverity is featured among the Best Places to Work in IT in Computerworld, the Inc. 5000, the Columbus Fast 50, is recognized as a Wonderful Workplace for Young Professionals and was named the #1 Best Place to Work in its category by Columbus Business First. Infoverity’s global headquarters is in Dublin, Ohio, and additional service and support teams are located in Spain, Germany and Russia. For more information on Infoverity solutions, visit Infoverity.com, follow @Infoverity on Twitter, and contact us today.